The web server with the IP-address 208.113.186.103 used by Childcareleadershipday.ca is owned by New Dream Network, LLC and is located in Brea, USA. 18 other websites are located on this web server. Most of them are provided in the english language. 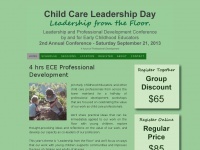 The websites of Childcareleadershipday.ca are served by a Apache server. The content management system WordPress is used. The markup language of the website is XHTML 1.0 Strict. Due to the robot information on the webpage, the following actions by webcrawlers are not allowed: using the description of the website from the Yahoo directory and using the description of the website from the Open Directory project. All other actions by webcrawlers are allowed.